It was bound to happen sooner or later. For the first time, social media has nudged museums aside as the primary venue by which American consumers discover works of art. According to a survey released this week by online auction site Invaluable, nearly 23 percent of Americans find artwork that appeals to them on social media channels such as Instagram or Pinterest. By contrast, 20 percent discover artwork by going to museums and nearly 16 percent by visiting brick-and-mortar galleries. The findings are significant not just because Americans drop an estimated $150 billion on arts and entertainment each year, but because it suggests that millennial buyers seem far more comfortable buying art online as opposed to the staid and starchy world of galleries and auction houses. 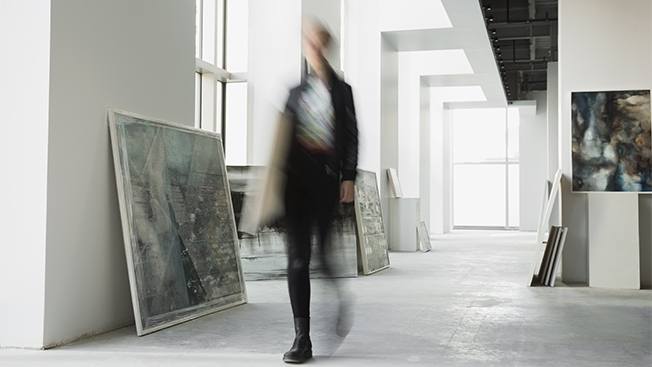 "As millennials continue to age, and their income continues to rise, we can anticipate that they will continue to purchase art online," Invaluable's vp of marketing O'Neal Rowe told Adweek. "This [survey] shows a lot of opportunity for our business to reach and engage young collectors as we prepare for the next generation of digital-first art buyers." It's not like the art world didn't know that millennial buyers were coming, or that they prefer to buy artwork online. Auction house behemoths Sotheby's and Christie's added online auctions as early as 1999 and 2006, respectively. But since then, a whole new crop of dot-com art auction sites has appeared, vying for market share and, clearly, millennial dollars. Online auction site Artsy opened business in 2009, followed by sites like Paddle 8 in 2011 and Auctionata the following year. Invaluable, which hit the web in 2009, now boasts 3 million unique monthly visitors and $10 billion in listed art. Rowe added that many of the sales Invaluable makes come via mobile devices—as much as 40 percent of its traffic. He added that's why his site's marketing efforts toward young art fans will continue to center on platforms including Instagram, Twitter and Facebook. Invaluable's survey findings—which are, not coincidentally, good news for Invaluable—are consistent with other recent studies that show the fine art world's indisputable shift toward the online world. Hiscox's 2015 Online Art Trade Report revealed that the global online art market, valued at $1.57 billion in 2013, had surged to $2.64 billion by 2014, and is on track to hit $6.3 billion by 2019. Earlier this month, the European Fine Art Foundation's 2016 annual report found that online art sales grew from a mere 1 percent of the art market in 2014 to 7 percent last year. The news isn't all bad for museums and art galleries, of course. Despite the rise of social media, close to 40 percent of Americans still visit museums once per year, and 14 percent go once per month, according to Invaluable's study. What's more, many of these online auction sites act as sales platforms for the old-line sellers to reach web-savvy collectors. Even so, Rowe said, traditional sellers of art would do well to follow the playbook of their online competitors if they want to hold onto their market share. "We believe it's now more important than ever for cultural institutions like museums, art galleries, auction houses and art fairs to develop a strong online presence to reach this audience," he said.